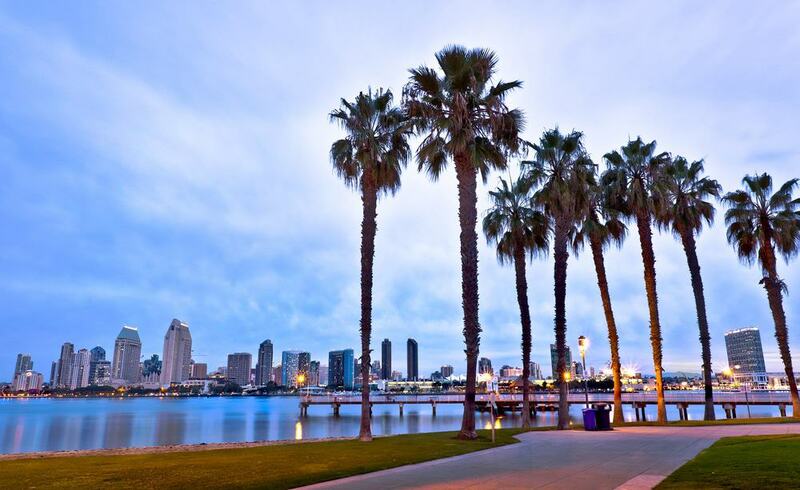 California’s birthplace and the first spot in the Western United States where Europeans stepped ashore, San Diego is a city with universal appeal. To go with the comfortable climate and laid-back style, San Diego Bay and its natural harbour have a rich military heritage. The colossal aircraft carrier USS Midway speaks to this, and stands as the mother of all museum ships. 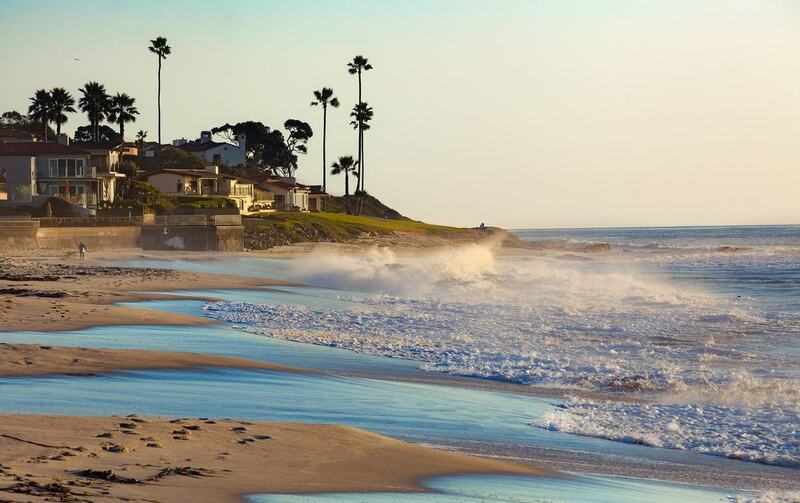 San Diego’s easy-going culture and miles of beach breaks may awaken the surfer dude in you, while Coronado and La Jolla have two of the best family beaches in the whole country. 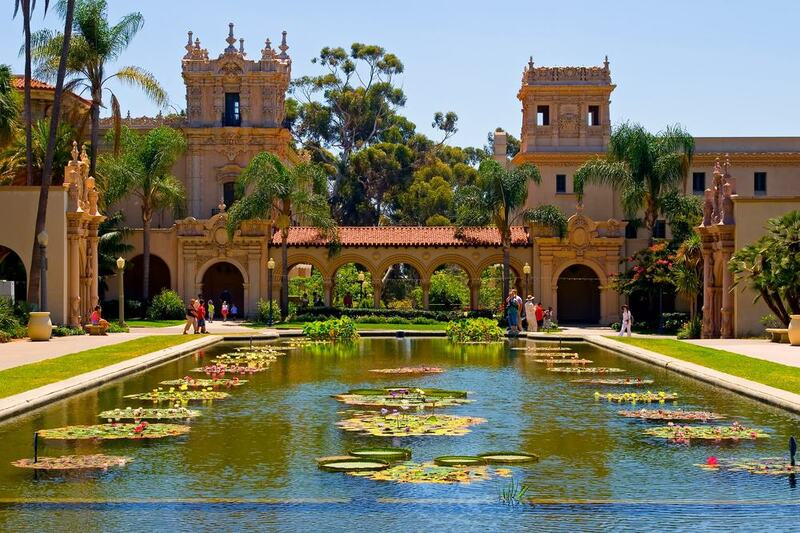 Set just north of the border, the city has a Mexican influence that spreads to its delectable cuisine, and there’s a deluge of culture at the museums, monuments and theatres of Balboa Park. 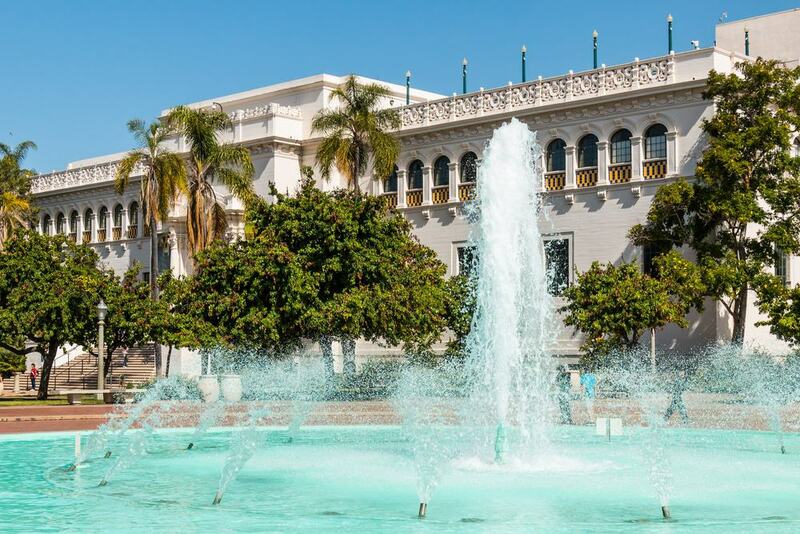 You’ll keep returning to this 1,200-acre urban park for its world-class zoo, restful cultivated areas, museums in refined Spanish Revival buildings and live shows. There’s a tapestry of gardens around the park, planted with more than 350 plant species hand-selected at the turn of the 20th century by the botanist Kate Sessions, the “Mother of Balboa Park”. An emblem for the park and San Diego is the Botanical Building, one of many splendid holdovers from the 1915-16 Panama-California Exposition. Among the largest lath buildings in the world, the Botanical House contains 2,100 individual plants and is fronted by a pond with annual displays of lilies and lotuses. San Diego’s walkable harbour-front is brimming with shops, interesting sights and eateries, and looks across the bay to Coronado Island. 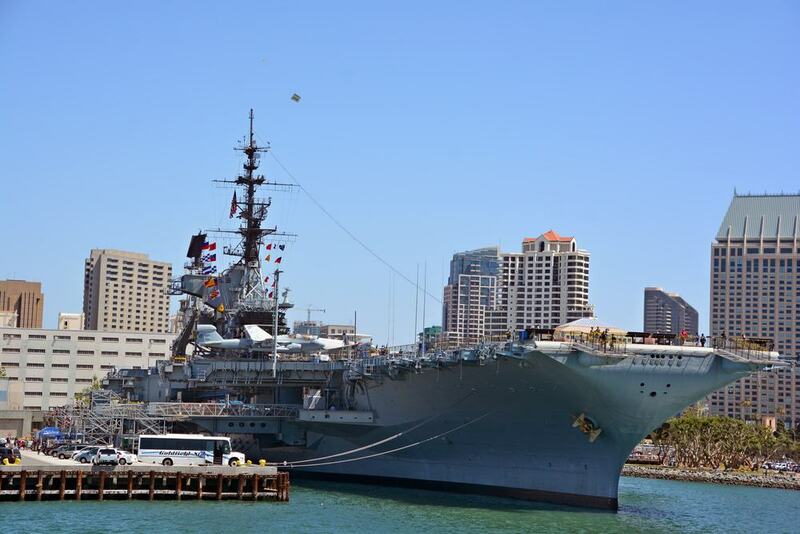 A lot of the Embarcadero’s interest is literally floating on the water, at the USS Midway and the heritage ships belonging to the San Diego Maritime Museum. This is also the place to board tour boats around the harbour and out in the ocean to spot whales. When the mercury rises kids can go wild at the interactive fountains in the Waterfront Park and adventure through the creatively designed playgrounds. In November the Embarcadero stages the San Diego Bay Wine & Food Festival, while the San Diego Symphony Orchestra plays the Bayside Summer Nights from late-June to the start of September. The longest-serving aircraft carrier in the world has been permanently moored at San Diego’s Embarcadero since 2004. Commissioned in 1945, the USS Midway served in the Vietnam War and Operation Desert Storm, before becoming the largest museum dedicated to aircraft carriers and naval aviation anywhere. GetYourGuide.com offers a self-guided audio tour of this humungous vessel, during which you’ll see over 30 restored aircraft, including 8 propeller planes, 14 jet aircraft and 8 helicopters. You’ll be led through the galley, brig, crew’s sleeping quarters, pilots’ ready rooms and engine room, and hear exciting snippets from people who served aboard the Midway. You’ll have lots of chances to get involved, testing simulators, climbing into cockpits and watching films documenting the dramatic events that took place where you stand. The west side of San Diego Bay is embraced by a long rocky peninsula that merits a visit for jagged topography, thrilling history and views you won’t soon forget. We’ll touch on a few of the sights on Point Loma later, but in 1542, this was the landing point for the first European expedition to what is now the West Coast of America. Given the peninsula’s setting, protecting the west flank of the harbour, Point Loma has a military presence going back to the 19th century. The 77.5-acre Fort Rosecrans National Cemetery (1882) is on the grounds of a former coastal artillery station. There are more than 100,000 graves here, and solemn memorials like the USS Bennington Monument, recording an accident in San Diego Bay that claimed 66 lives in 1905. Head to the marina for whale watching expeditions, and to Osprey Point were climbers scale the rocks and fishers camp over the water. The upscale oceanfront community of La Jolla is on a rocky headland poking out into the Pacific and surrounded by water on three sides. 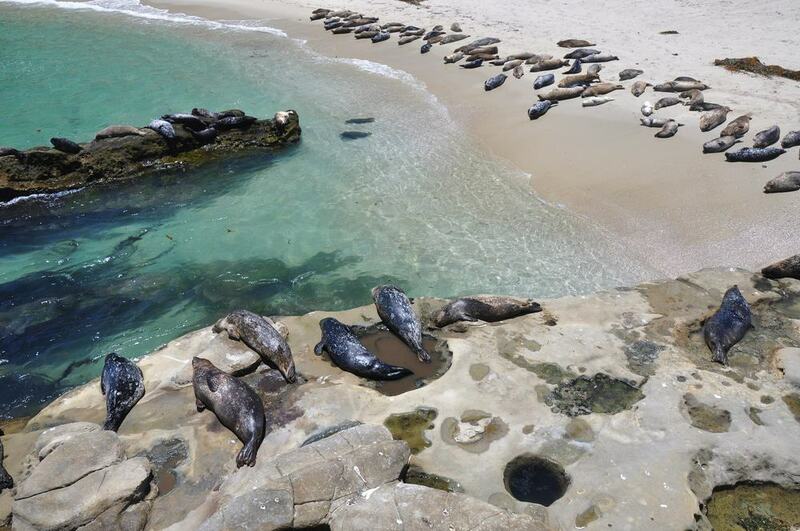 La Jolla means fine dining, cliffs with sea caves and little coves where seals and sea lions rest on the sand. We’ll stop by La Jolla many times on this list, visiting the famous Torrey Pines and its State Reserve, beaches and golf course. La Jolla proper has a cosmopolitan, European feel in its cafes, boutiques, low-rise houses and steep stairways. 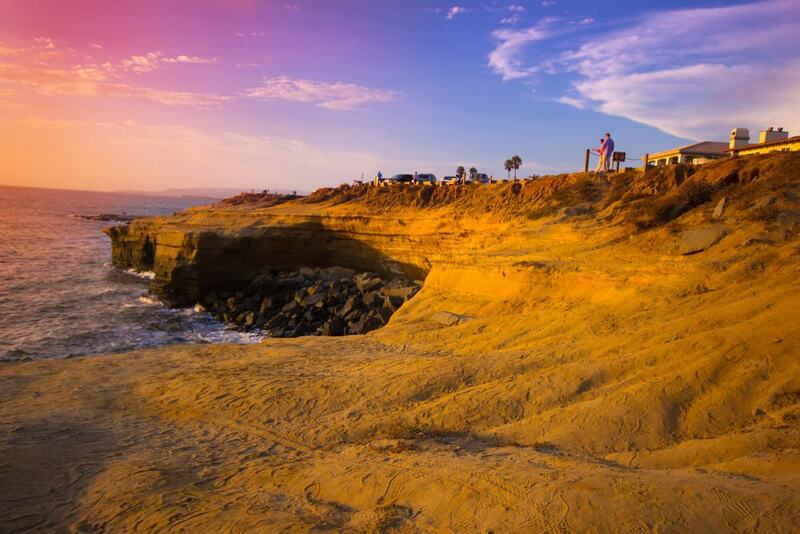 At Ellen Browning Scripps Park by La Jolla Point you can contemplate the majesty of the Southern Californian coast, catch open-air concerts on summer evenings and see the fireworks on the Fourth of July. Make a detour to the Legends Gallery on Prospect Street, which has original art by former La Jolla resident Theodor Seuss Geisel (Dr Seuss). San Diego’s Spanish past and proximity to Mexico makes for amazing food. We’re talking about some of the best fish tacos, carne asada, enchiladas around. These dishes are underpinned by ultra-fresh ingredients like avocados, tomatoes, eggplant and fruit, all grown locally. San Diego is the birthplace of the comforting California Burrito, which has French fries and carne asada. Oscar’s Mexican Seafood makes a mean fish taco and great ceviche, and has four locations around the city. The craft beer scene in San Diego is something to be reckoned with, and the Toronado craft pub (56 rotating draughts), and the multi-award-winning Societe and Ballast Point production breweries need to be in the plans of any beer aficionado. 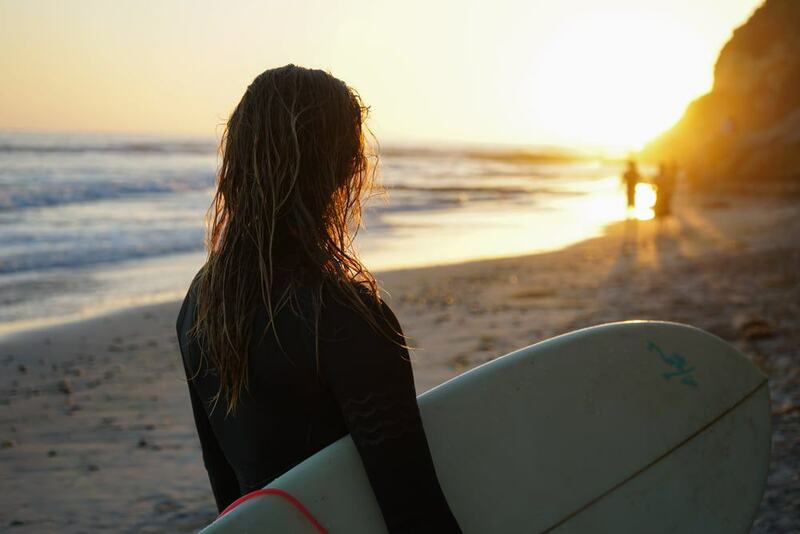 Surf culture is woven into San Diego’s identity and the county’s 70 miles of open ocean coastline has more surf spots than we could list here. Much of the shore has southwest facing beach breaks, while there are rockier sections with reef breaks at La Jolla and Point Loma. Avid surfers are always ready to travel for the perfect wave, and this might mean a trip up to the highly popular Swami’s, which was mentioned in the Beach Boys’ Surfin USA. 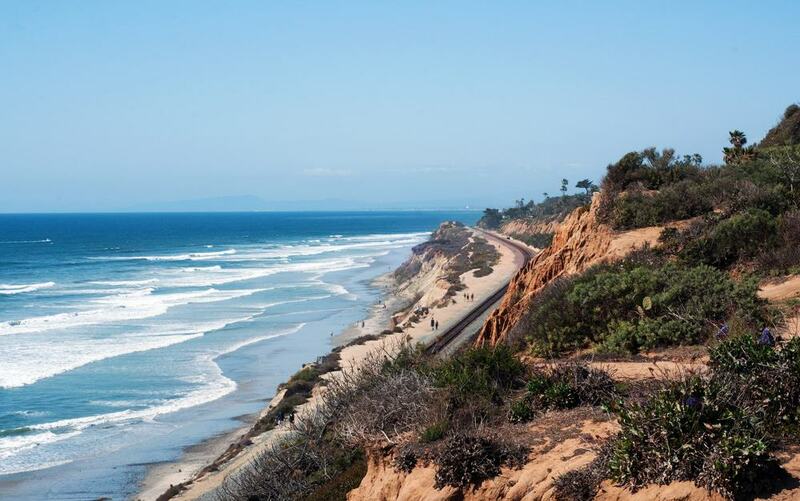 The river mouth point break at Trestles is world renowned and hosts WSL competitions from May to September. Honourable mentions go to the beach breaks at Oceanside and the spacious Del Mar, where you won’t have to jostle for a wave. There are shops for gear rental near every major spot. And if you’d rather keep your feet on dry land, you can watch some great surfing action from the rocks at Windansea in La Jolla. At the southern tip of Point Loma you’ll stand where a European person first set foot on the West Coast. Juan Rodríguez Cabrillo’s expedition arrived here on 28 September 1542, and he named the bay San Miguel (this would change to San Diego in 1602). 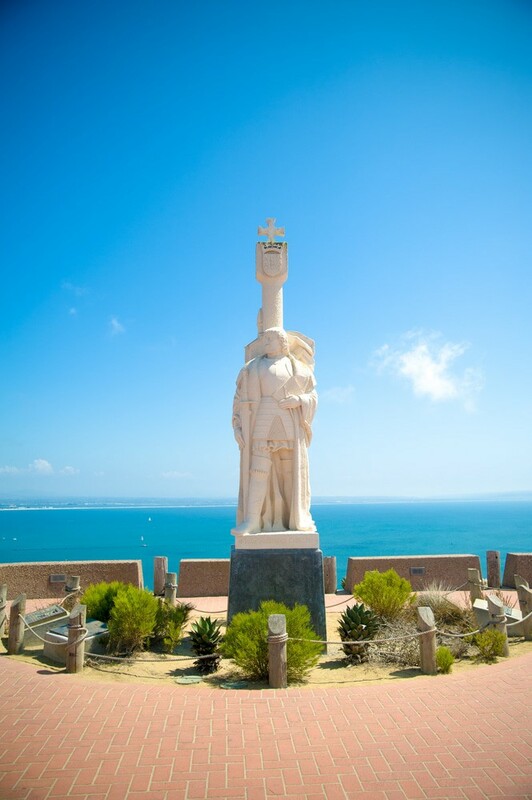 The original heroic statue of Cabrillo was donated by the Portuguese government in 1939, while the current replica has stood since 1988. 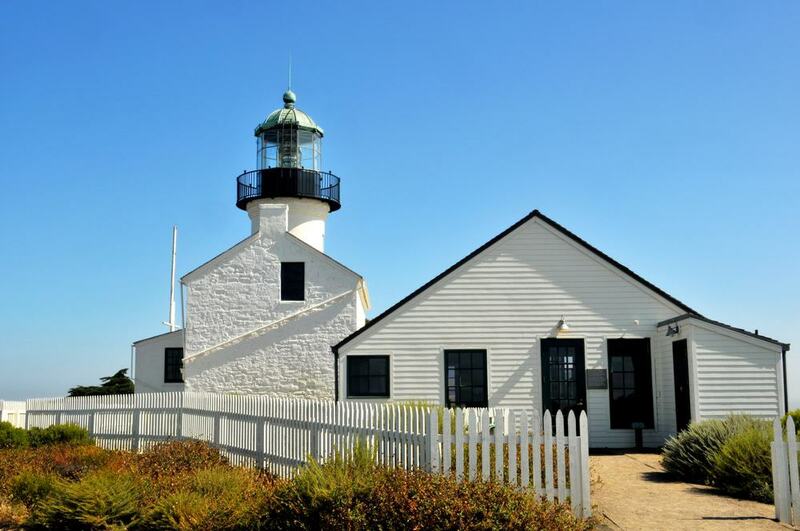 The national monument’s visitor centre has a movie and exhibits to retrace Cabrillo’s voyage along the Californian coast. Outside you can still see the old coastal batteries that protected the harbour and check out the Old Point Loma Lighthouse, which has been converted into a museum. But maybe best of all is the widescreen view of San Diego’s skyline, the harbour, across to Coronado and down to Tijuana. 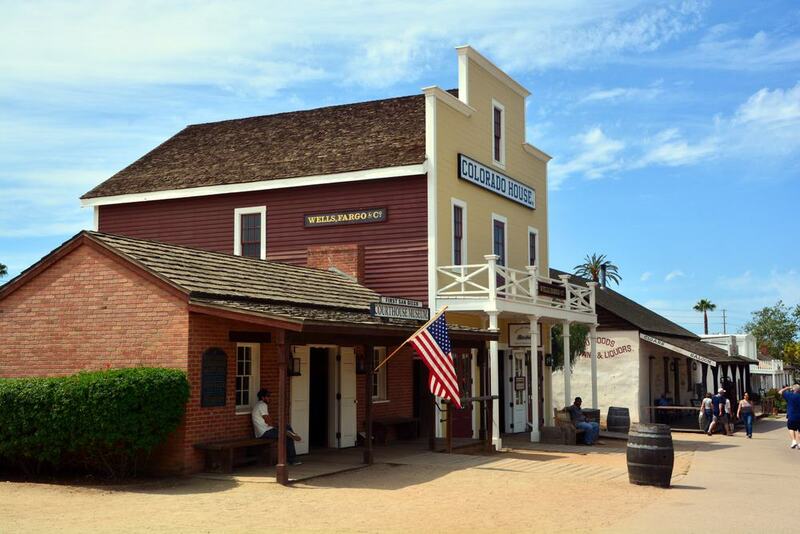 The site of the first European settlement in present-day California, the San Diego Old Town is a visitor-friendly neighbourhood with historic adobe buildings from the city’s early days between 1820 and 1870. There’s wonderful set of preserved streets in the State Historical Park, which we’ll talk about next. 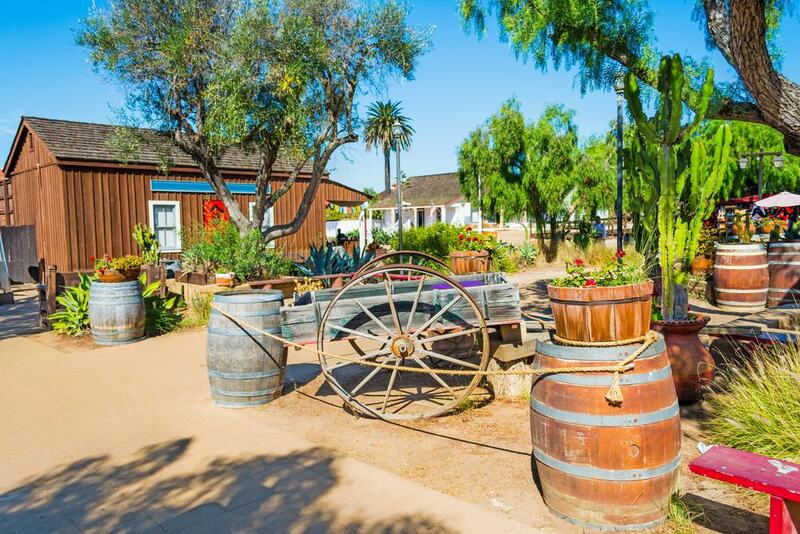 In the 40-acre Presidio Park you’ll be at the site where the San Diego Mission and the San Diego Presidio, the first settlements in modern day San Diego, were founded in 1769. The Old town is a great place to go for real Mexican food and brims with specialty shops and art galleries. There’s lots of colour during annual festivities like Fiesta Navidad, Cinco de Mayo and Día de Muertos in November. A time warp back to the mid-19th century, the State Historical Park in the Old Town is scattered with restored historic buildings, including five original adobes, as well as detailed replicas. The finest of the adobes is the Casa de Estudillo from 1827, one of the oldest remaining pieces of Spanish architecture in California. The park is free to enter and gives a sense of the intersecting cultures, as a Mexican pueblo became an American settlement. There’s constant activity, with burros to pet, shopkeepers happy to share their stories, and artisans showing off their knowhow: At the Black Hawk Smithy & Stable you can see a blacksmith working the forge. There are shops, little museum and restaurants, while the Historic Plaza has a full schedule of cultural celebrations and events. 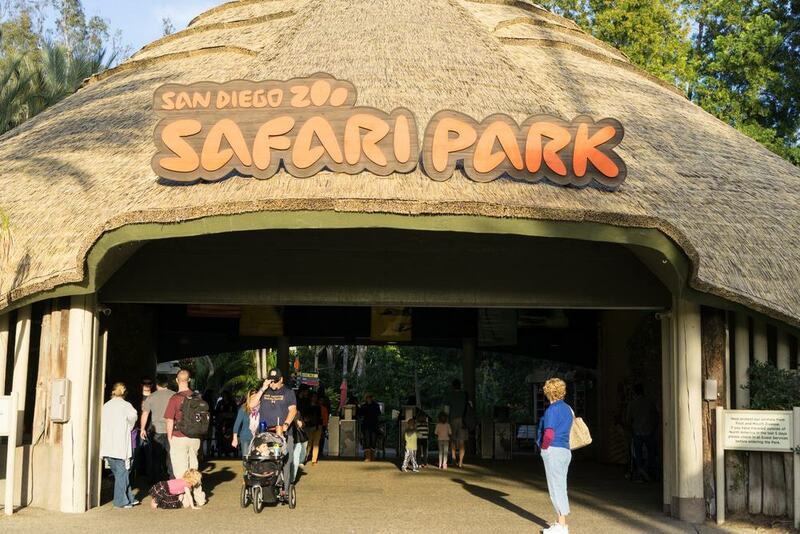 Founded by the physician Harry M. Wegeforth after he was inspired by the roar of a lion at the Panama-California Exposition in 1915, the San Diego Zoo is rated among the best in the world and houses more than 650 species. 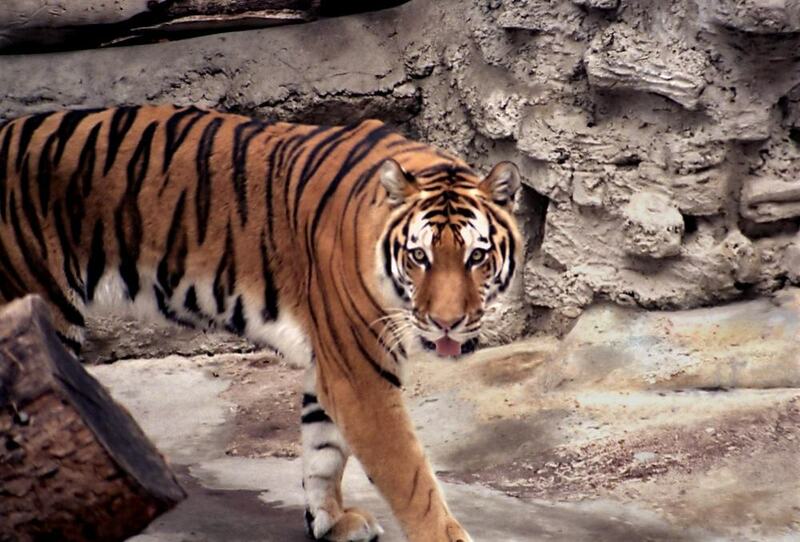 This was one of the first zoos to build cageless exhibits, and opened the first ever moated lion enclosure in 1922. You can beat the heat and get around on a guided tour bus that covers three quarters of the park, or the Skyfari tramway from 1969. As with the best zoos, the enclosures tally with natural habitats, so there’s African rainforest inhabited by gorillas, some of the world’s largest free-flight aviaries, as well as Arctic woodland and tundra for polar bears. The San Diego Zoo is one of only four zoos in the United States to have Giant Pandas, and these are in the Panda Trek, while the Giant Panda Discovery Center has clever multisensory exhibits revealing how these creatures sound and smell. At the Embarcadero in the shadow of the USS Midway you can set sail on a 1-hour cruise around San Diego Bay with GetYourGuide.com. A great way to get to know San Diego quickly, the cruise will give you a fresh angle on more than 50 landmarks and ships immortalised by movies and popular culture. 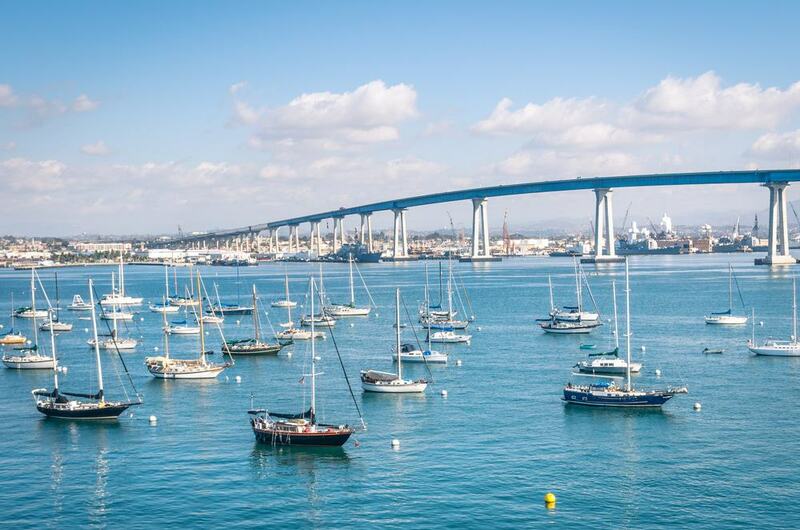 You’ll get a rare chance to see the San Diego-Coronado Bridge from the water, and spot wildlife like pelicans, herons and sea lions. All the time there will be in-depth and entertaining commentary by an experienced guide, passing on anecdotes about the navy in San Diego and the work being done to improve the bay as a marine habitat. Between December and April the California Gray Whale migrates from Northern Alaska to Baja California to give birth in warmer climes, passing by San Diego. 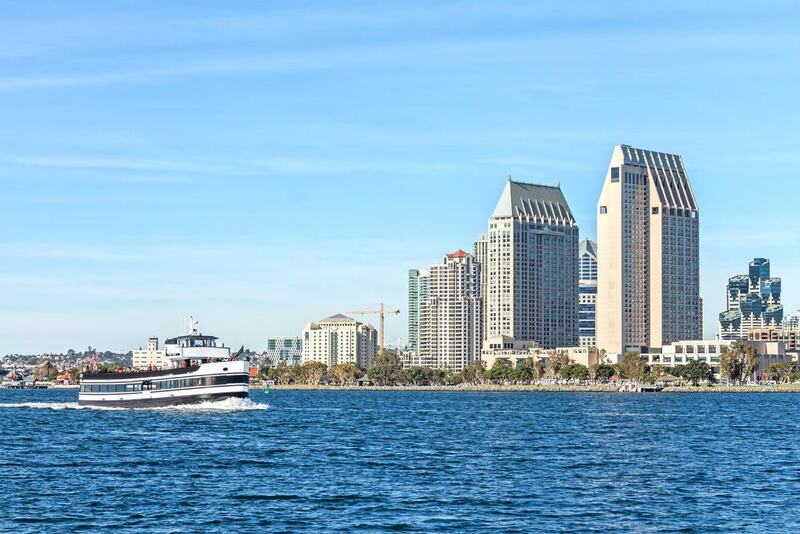 In this season you can head to the Embarcadero for a whale watching cruise, up to four hours long. On this comfortable voyage with indoor and outdoor seating, you’ll be joined by a qualified naturalist from the San Diego Natural History Museum, giving riveting insights about these cetacean visitors. The likelihood of seeing a dolphin or whale is high, to the point where you’ll get a free pass for another tour if you don’t see anything. But you are guaranteed to spot plenty of sea lions and harbour seals, and can soak up San Diego county’s extraordinary Pacific coastline from the ocean. Right in downtown San Diego, Little Italy is a neighbourhood that has its roots in the city’s once lucrative tuna industry. The last of the canneries closed in the 1980s, but those facilities and the boat fleets were manned by immigrants from mainland Italy and Sicily. 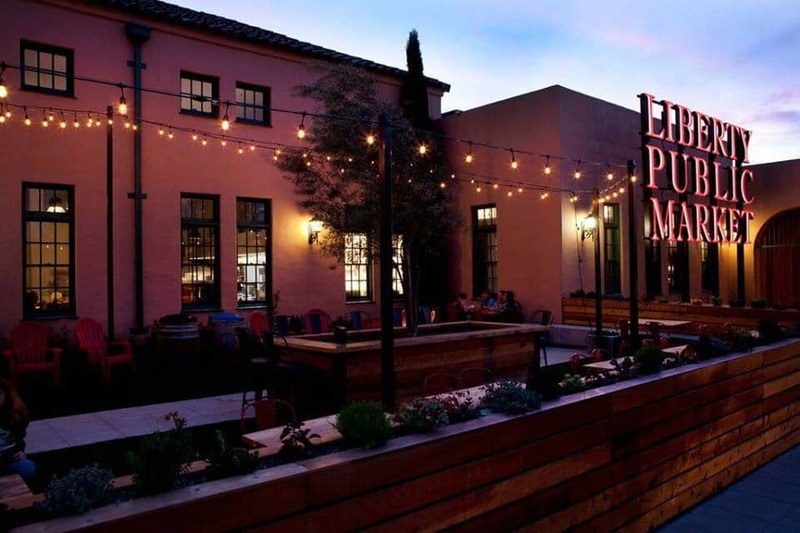 From the 19th century they settled close to the Embarcadero in what is now a congenial area of galleries, one-of-a-kind design shops, pizza spots, restaurants, bodegas, breweries and cafes that spill out onto patios. The Saturday “Mercato” street market shuts down several blocks and has become a San Diego institution. 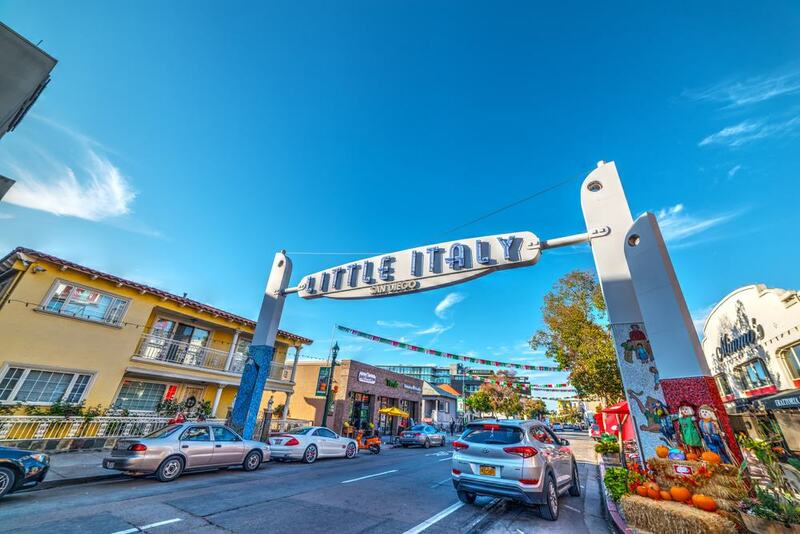 Get a snap of the “Little Italy” sign and take a piece of paper and pencil to the tables at Amici Park, which have bronze tablets with recipes for dishes like stuffed artichokes, fava bean spread and fish tacos. 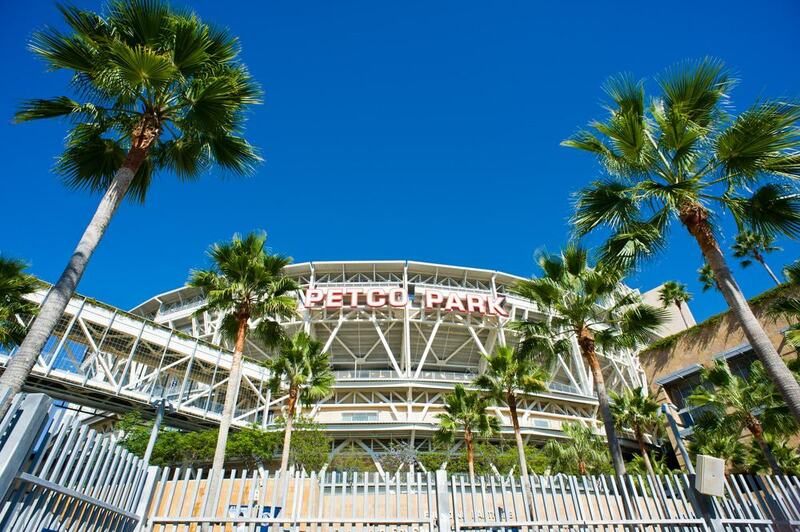 Right in downtown San Diego, the state-of-the-art Petco Park is lauded as one of Major League Baseball’s best stadiums. In the stands you’ll get incredible vistas of the Sand Diego skyline and San Diego Bay at one of 81 regular season games (more if the Padres have a successful season). Petco Park opened in 2004, before which the San Diego Padres had to share the Jack Murphy Stadium with NFL’s Chargers. There’s a real feeling of ceremony as you approach the steel and sandstone facade of this venue, passing through a palm court and water walls. Petco Park has an entertainment zone to keep kids engaged, and you get to know the Padres’ history and great players at the new Hall of Fame. 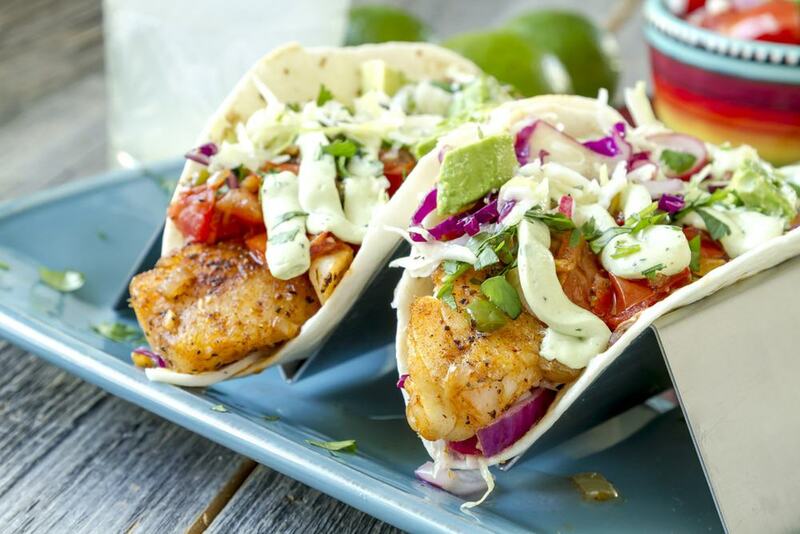 Food is an essential part of the baseball experience, and you can get anything from sashimi to fish tacos, Roman-style pizza, BBQ, oysters and gourmet hotdogs at Petco Park. This compact north-facing cove in La Jolla is one of the most photographed pieces of the California coast. And with good reason as the scenery is breathtaking: The beach, within a 6,000-acre ecological reserve, is hemmed by rocks hollowed with caves by the relentless ocean. Being a natural park there’s lots of wildlife from the seals and sea lions sunning themselves on the beach and rocks, to the barracuda, batfish and giant sea bass in the waters. 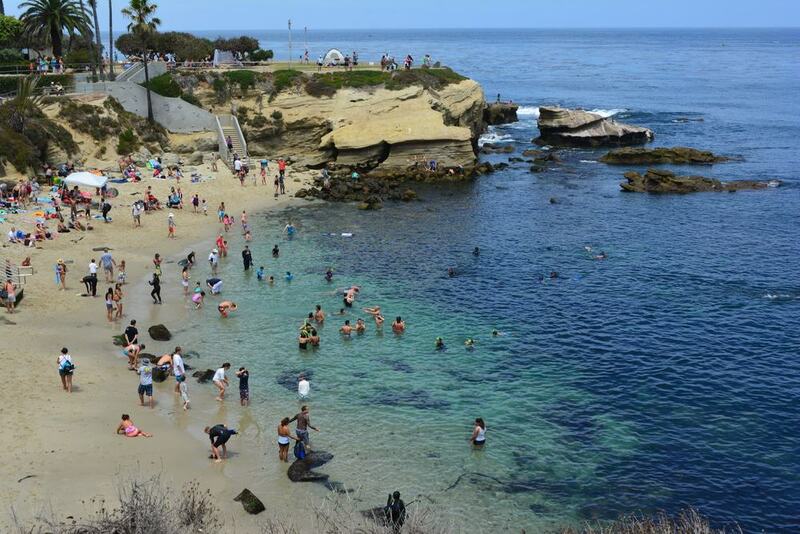 The surf can be powerful, so La Jolla Cove isn’t ideal for swimming. But if you’re in the mood for adventure you can go diving to discover the ecological park’s underwater life, while kayak and bike tours are also on the agenda. End the day at an oceanfront restaurant watching the sun go down. 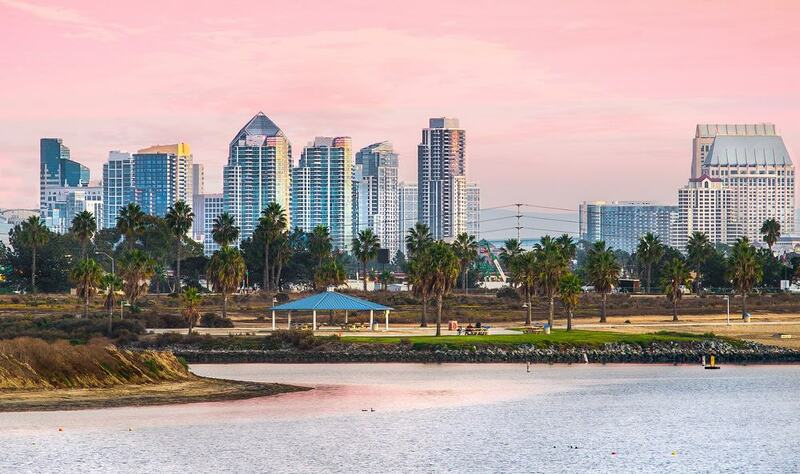 Pack a picnic in a cooler, and cross the monumental San Diego-Coronado Bridge for a day at one of the best beaches in America. With the sophisticated architecture of the Hotel del Coronado and a parade of beachfront mansions in the background, Coronado Beach is long, flat and soft. These sands even seem to glisten, an effect caused by their high mica content. Point Loma in the west helps defend Coronado from the strongest Pacific swells, so the beach is safe for swimming and has a team of lifeguards on duty. You can rent a bike or pedal cart and drift along Ocean Boulevard, while there are fire rings on the north end for smores as the sun sets. San Diego’s easy-going beach town is adored by 20-somethings for its party atmosphere and two miles of Pacific beach. 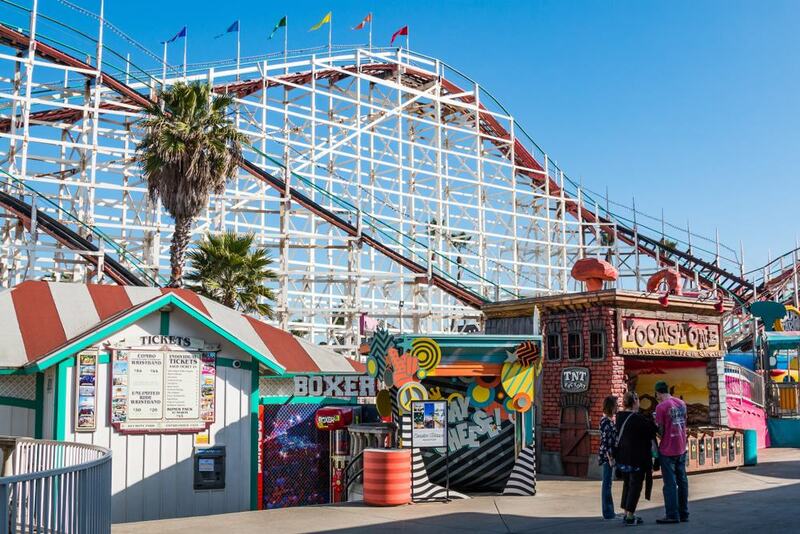 This is lined with a boardwalk, enlivened by Belmont Park’s vintage rollercoasters and amusements. If you’d prefer peace and relaxation, the South Mission Beach area is a little more tranquil. There’s prime beach weather in San Diego from June to September but the season extends to the spring and autumn months, and you’ll even see people lazing on the beach in December if the sun is out. You can rent a bike and see the sights on the boardwalk, sign up for whale-spotting cruises, while there’s adventure golf, a string of playgrounds, surf shops and lush gardens with lofty palms. An almost overwhelming medley of Spanish Renaissance and Baroque painting awaits at this museum in Balboa Park. El Greco, Murillo, Goya and Zurbarán are all here, together with Italian and Dutch Masters like Veronese, Canaletto, van Dyck, Rubens and Frans Hals. In the last few years, the museum was donated a raft of paintings from the Symbolist, Expressionist and New Objectivity movements, by Gustav Klimt, Egon Schiele, Robert Delaunay, Otto Dix and Alexej von Jawlensky. The venue is striking too, with an appropriate Plateresque (Spanish Renaissance) facade, taking cues from the Cathedral of Valladolid. This was built in 1926 to harmonise with Balboa Park’s buildings from the 1915-16 Exposition. The museum has a busy programme of cocktail evenings, film screenings and after hours viewings, as well as fun activities for kids on school holidays. A Mission Beach linchpin, Belmont Park was opened by the sugar magnate John D. Spreckels back in 1925. This amusement park has 12 rides, three oceanfront eateries, an 18-hole Tiki-themed mini golf course and a host of smaller attractions. But the king of Belmont Park has to be the time-honoured Giant Dipper. This wooden rollercoaster arrived with the park and is a National Historic Landmark of its own. Riding the giant dipper is a rite of passage for kids growing up in San Diego, but there are also high-octane rides like Control Freak, Octotron and Beach Blaster to keep the adrenaline pumping. At the Sweet Shoppe, see if you can handle a Monster Waffle Cone ice cream. 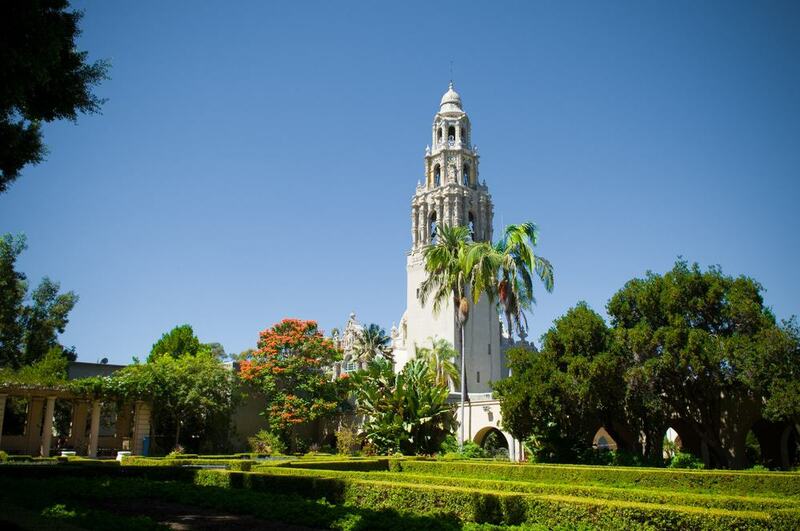 One of the first ports of call at Balboa Park is the San Diego Natural History Museum, the oldest scientific institution in Southern California. 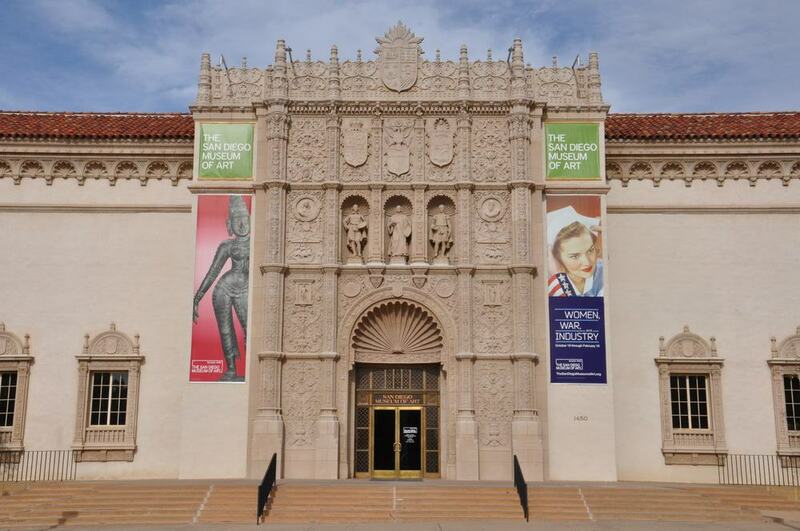 The museum was established in 1874, and its current Spanish Revival home (1933) was given a Postmodern facelift at the start of the new millennium. The exhibitions are compelling for people of all ages. Take Fossil Mysteries, examining California and Baja California’s rich prehistory, and packed with spectacular fossils, models, dioramas, interactive stations and murals. You can venture through Southern California’s varied ecosystems at Coast to Cactus, and study the state’s complicate relationship with H2O at Water: A California Story. One medium-term show open until 2020 preserves the 130,000-year-old mastodon bones and tusks unearthed at a site in San Diego. You can also watch eye-popping 2D and 3D presentations at the giant theatre, showing the wonders of the ocean and taking you back to the Ice Age. 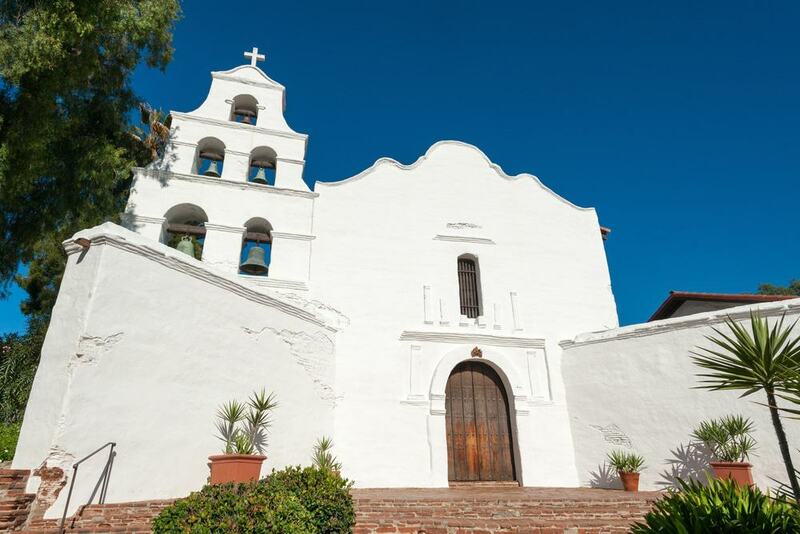 Set up in 1769, this was the first Franciscan mission in the Californias, and was the location for the region’s first execution and its first Christian burial. Beneath the chancel also lies the body of California’s first Christian martyr, Father Luis Jayme, killed by Native American Kumeyaay warriors in 1775. The current church is from the early 19th century and was restored in 1931 following a long abandonment. The largest bell in the campanile is original, dating to 1805 and cast with a crown representing the King of Spain. There are daily tours of the compounds, where you’ll the remnants of the “convento”, which housed the friars in the early 19th century. In the church, see the 15th-century choir stalls, carved with vegetal patterns and strange beasts. 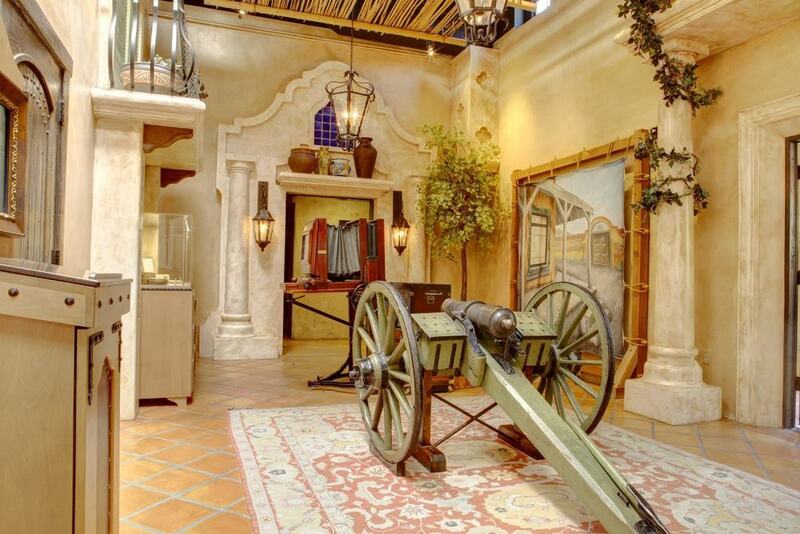 The Mission Museum has archaeological finds like tools, pottery and weapons, as well as examples of Kumeyaay handicrafts and photographs of their elders. In Balboa Park’s fabulous Streamline Moderne Ford Building (1936) the San Diego Air & Space museum chronicles the evolution of human flight with models and genuine artefacts. At this Smithsonian affiliate you can get in touch with the interwar Golden Age of Flight, represented by aircraft like an Aeronca C-3 Collegian, a Consolidated PT-1 Trusty and a Ryan STA. There are gleaming engines from this period and artefacts for the likes of Amelia Earhart and Charles Lindbergh. You can go back further to see faithful reproductions of the Wright Brothers’ gliders, and zoom forward to the Jet Age, represented by a Douglas A-4B Skyhawk, a Boeing GPS-12 Satellite and a the canopy of the game-changing North American X-15 rocket plane. There are also flight simulators, an “Action Hangar” play area for little ones and a 3D/4D theatre for pulsating shows. There are 94 historic buildings in this 16 block heritage area in downtown San Diego, bordering Petco Park and the Convention Center. 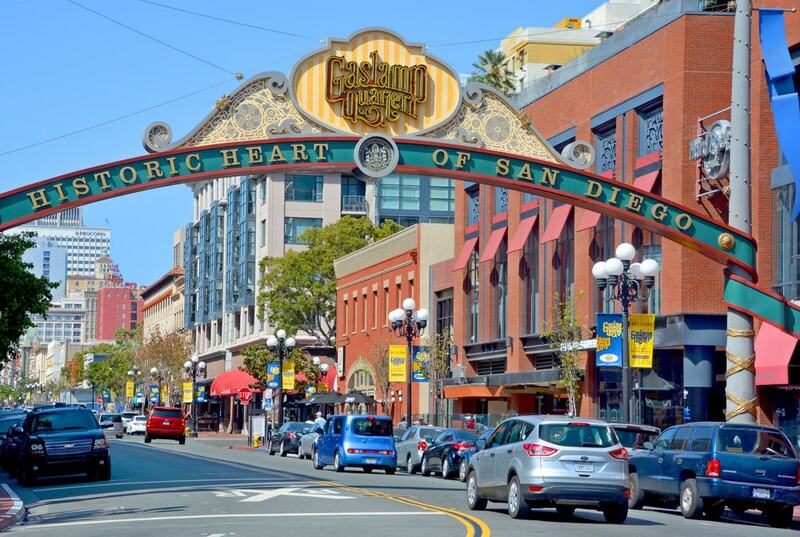 The Gaslamp Quarter, heralded by a gateway arch on Fifth Avenue, dates from 1867 when the real estate developer Alonzo Horton envisaged a new city centre nearer the San Diego Bay. If you’re in San Diego to sample the food scene and nightlife you’re sure to find yourself in the Gaslamp Quarter at some point, in a neighbourhood of more than 100 sidewalk restaurants, craft breweries, concept cocktail bars and rooftop lounges. There’s lots going on here during Comic-Con in July, as well as big street parties for Mardi Gras and St Patrick’s Day. Roosted on a bluff over the campus of the Scripps Institution of Oceanography, this noted aquarium reveals the spectrum of marine life of the Pacific Ocean. You can get there in 20 minutes from downtown San Diego, and start with the Hall of Fishes. 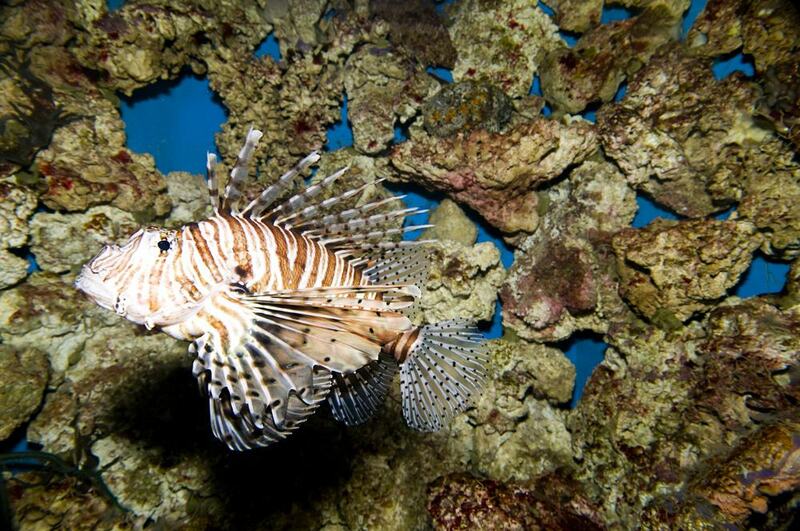 This has an array of habitats, from the brisk waters of the North West to the tropical climes of the Indo-Pacific. There’s a 260,000-litre kelp forest tank, coral reefs and a much-loved loggerhead turtle that was rescued. At the Tide-Pool Plaza, youngsters can get to know the creatures inhabiting Southern California’s tide pools like starfish, hermit crabs, lobsters and sea cucumbers. There’s Something About Seahorses is a showcase for this peculiar creature, while Feeling the Heat is a jolting look at the effects of climate change. 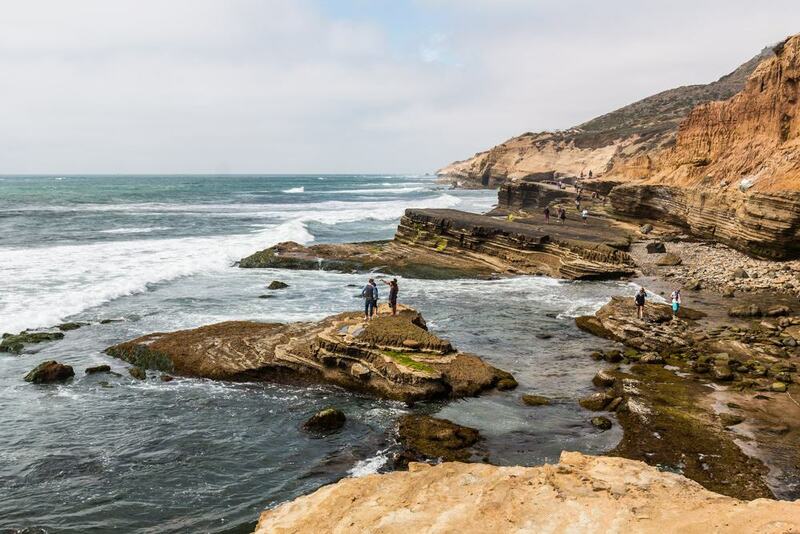 Conserving some 2,000 acres of rugged Pacific coastline north of La Jolla, this National Natural Landmark is on a plateau skirted by high cliffs for a awesome views of the ocean. There are eight miles of trails, and you can use the Beach Trail to get down to natural un-touristy beaches with almost no signs of civilisation. The park is a vital habitat for the endangered Torrey Pine, which only grows in this location and off the coast of Santa Barbara on Santa Rosa Island. During the migration season you may get to see gray and blue whales from the cliffs. Stop by the charming pueblo-style visitor centre, which is the departure point for guided on walks on weekends and holidays at 10:00 and 14:00. On the cusp of the State Reserve is a public platform for hang gliding and paragliding posted on cliffs above the Pacific. If you’re intent on taking to the skies but have no experience you can take part in a tandem hang gliding or paragliding flight, starting at a couple of hundred dollars. But most of the visitors to the Gilderport are here just to bask in the scenery and feel the ocean breeze. 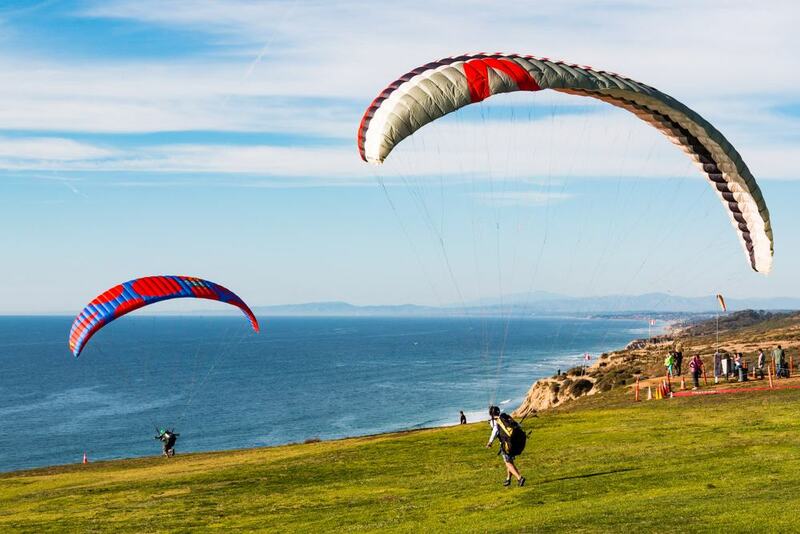 There are benches to linger over the views of the Pacific and the coastline down to La Jolla, and you can watch the gliders take off, tuck into an outsized sandwich at the Cliffhanger Cafe and enjoy some live music on Saturday afternoons. On the west flank of Point Loma is a glorious 68-acre park protecting rough-hewn ocean bluffs, caves, natural arches and tidepools. There’s no mystery to the name, as you may not find a better spot within easy reach of downtown San Diego to watch the sunset. 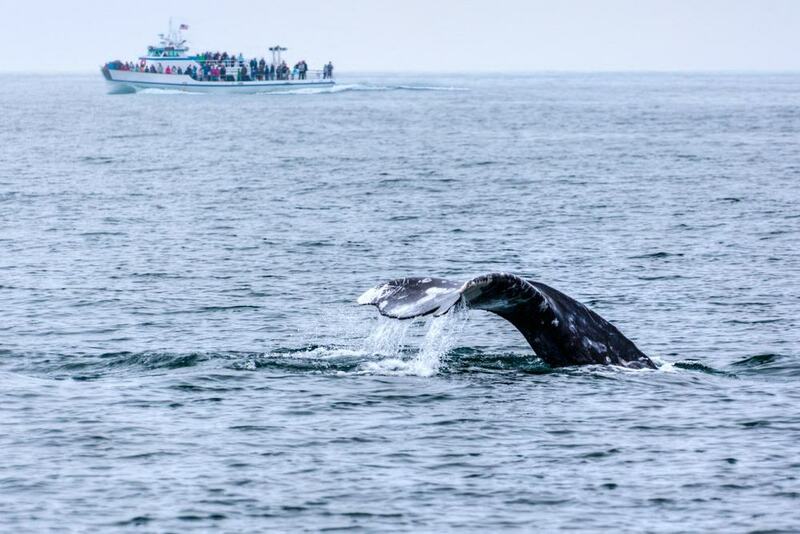 And as with many high vantage points on the Southern Californian coast, there’s a good chance of spotting gray whales between December and April. By road the scenery is sensational on the Sunset Cliffs Boulevard between Adair Street and Ladera Street. Set in four imposing Spanish Revival buildings from the Panama-California Exposition, the Museum of Man has just celebrated its centenary. Here you can study pre-Columbian history, getting to know local Native American cultures, as well as Mesoamerican civilisations like the Mayans. The exhibitions approach these topics in fun, enlightening ways. Take, BEERology, looking into the 10,000-year history of beer brewing and featuring a solid gold beer cup belonging to an Incan king some 600 years ago. Monsters! is a family-oriented exhibition about mythical beasts like the Kraken, unicorns, dragons and the Yeti. You can also delve into the origins of race on the second floor, and delight in one of the United States’ greatest collections of Egyptology, with masks, pottery, sarcophagi and two authentic mummies. 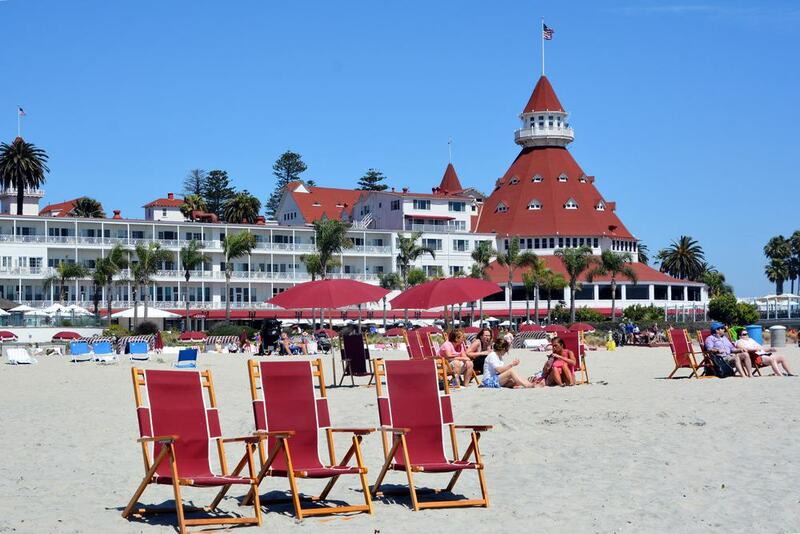 The pride of Coronado is a magnificent Victorian beachfront hotel and National Historic Landmark, now owned by the Hilton brand. 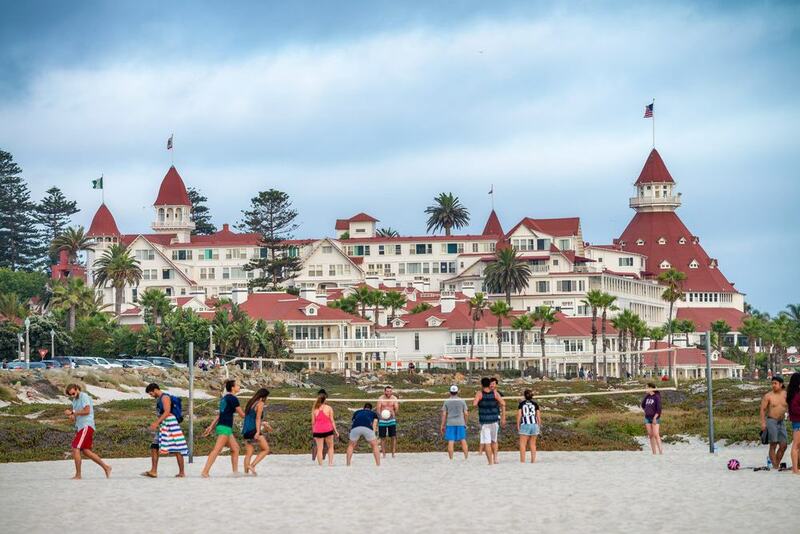 When the Hotel del Coronado opened in 1888 it was the world’s largest resort hotel. Counted among its distinguished list of guests are Rudolph Valentino, Charlie Chaplin, Mae West, Clark Gable, Babe Ruth and Edward VIII (then Prince of Wales). No fewer than 16 presidents have stayed at the Hotel de Coronado, in an unbroken line going back to President Eisenhower. The building, easily identified by the conical roofs on its towers, has appeared in 12 films, most famously Some Like it Hot (1959). You don’t have to book a room to get the inside track, as there are daily 75-minute tours through the building and its ornamental gardens. Out in the semi-arid environment of the San Pasqual Valley you may wonder if you’ve stumbled into the real savanna at the San Diego Zoo’s Safari Park. In 1,800 acres, you’ll take road train and truck caravan rides through vast landscapes of the African Plains and Asian Savanna to view wildebeest, springboks, gazelles, giraffes, antelopes, rhinos and many more. The recent Tiger Trail is a walking exhibit where you’ll come within inches of Sumatran tigers, while the Nairobi Village and Gorilla Forest have an aviary and habitats for meerkats, lemurs and the formidable Western Lowland gorilla. The Lion Camp is home to a family of 13 lions, and you’ll see just how fast a cheetah can move at the Cheetah Run at the African Outpost. For something unforgettable, take the Flightline Safari, a zip-line more than 40 metres over the giraffes and rhinos in the park’s African Plains. The Mormon Battalion was the only unit formed along religious lines in the history of the United States military. It comprised between 534 and 559 followers of the Church of Jesus Christ of Latter-day Saints. This infantry unit was commanded by Mormon company officers who answered to regular U.S. Army command. The Mormon Battalion served for a year during the Mexican-American War of 1846-48 and is remembered for an almost inconceivable 1,900-mile march from Iowa to San Diego, together with 80 women and children. The newly revamped visitor centre at the site of the battalion’s arrival point in the Old Town gives free daily tours and has interactive multimedia displays and artefacts shining a light on the unit. You can also learn more about the livelihoods of the day, like panning for gold and brick-making, and get to know the inner-workings of muskets and cannons. Pushing on for a mile in northern La Jolla, this beach may be the best in the San Diego area for families. While many of the beaches around La Jolla are sequestered little coves, La Jolla shores has an accommodating crescent of pale sand. 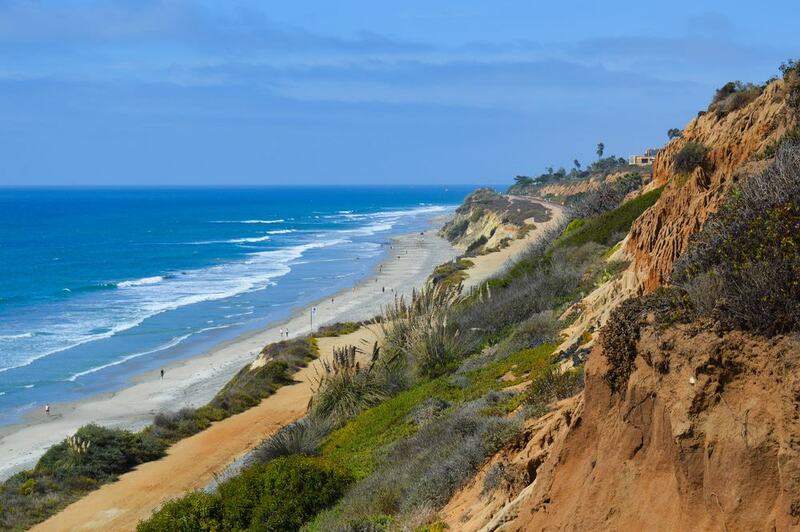 The beach is trimmed with grass and a line of towering palms, and blessed with majestic views north to the 30-metre cliffs of Torrey Pines. 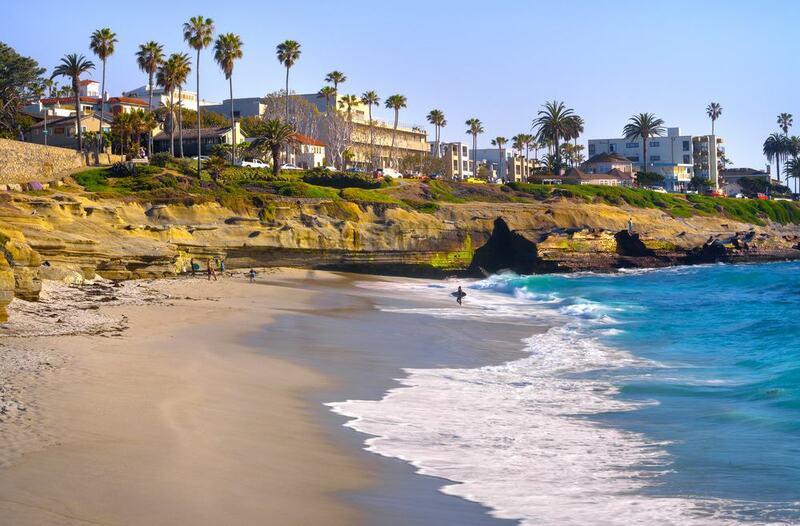 What makes La Jolla Shores such a hit with families is the low surf and very shallow gradient. In summer the waves are the gentlest of any San Diego beach, and this is down to La Jolla’s rocky headland screening the southwest side of the beach. The light surf is just right for sea kayaking and diving, and passing by at night you’ll see the shore glinting with beach fires. 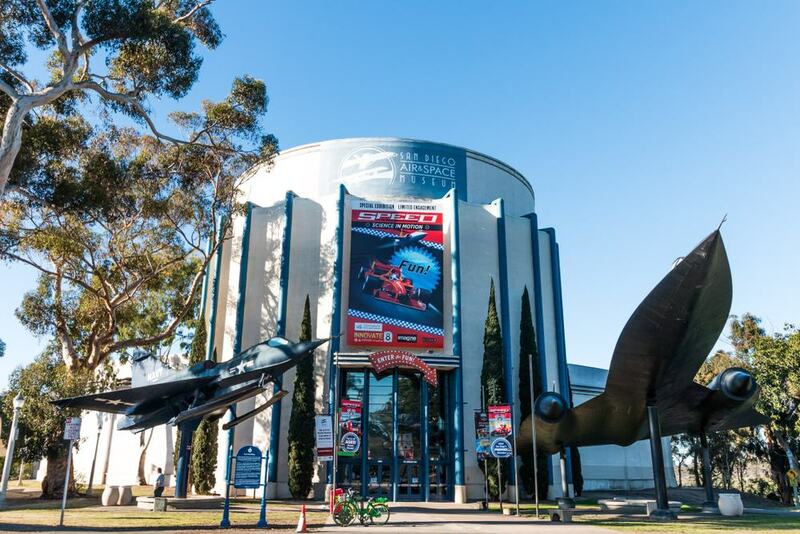 A planetarium and interactive science museum, the Fleet Science Center in Balboa Park was a trailblazer when it opened in 1973. Younger children will get the most out of the self-guided permanent exhibitions where they can explore outer space, learn the ins and outs of San Diego’s water system and discover the unseen world of nanotechnology. For toddlers the Little Learners’ Lab is a play zone with varying shapes and textures, while the Ball Wall has a little world of shoots, tracks and moving objects. The Heikoff Giant Dome Theater has three IMAX shows screening several times a day. In summer 2018 these were “Aircraft Carrier”, “Great Barrier Reef” and “Pandas”. Next door to Mission Beach and on the way to La Jolla, Pacific Beach is another belt of dreamy Pacific coastline, edged by Ocean Boulevard and its many amenities. 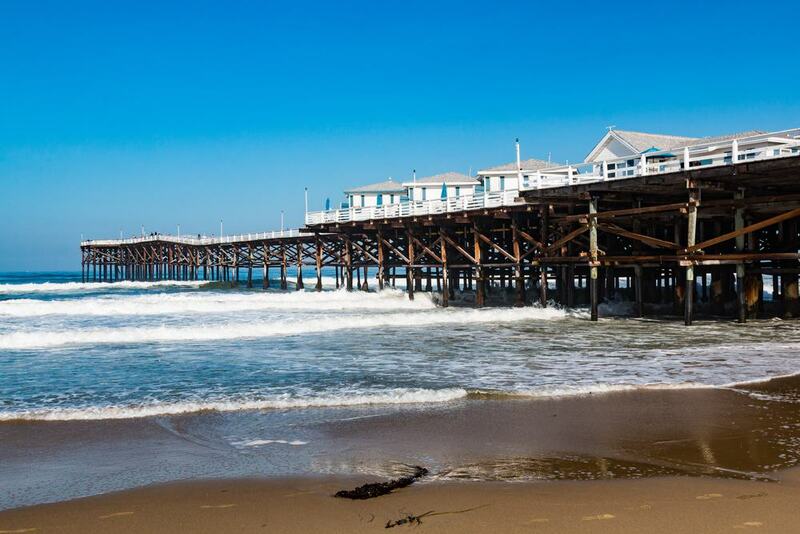 The beach seems never to end, continuing past the Crystal Pier where it becomes North Pacific Beach, preferred by families for its lifeguard supervision. The area, Pacific Beach, has been gentrified since the 1990s and partying college students have moved down to Mission Beach to be replaced by plush condos, upmarket restaurants and a slightly older crowd. Go for a stroll along Crystal Pier, which is flanked on the landward end by quaint weatherboard holiday cottages. If you can avoid the many fishing rods, you can watch the waves break from the end of the pier and look back to the city and up to La Jolla. On the Embarcadero’s Waterfront Park, a few steps from the USS Midway, is one of the nation’s largest collections of historic vessels, all ready to be boarded. 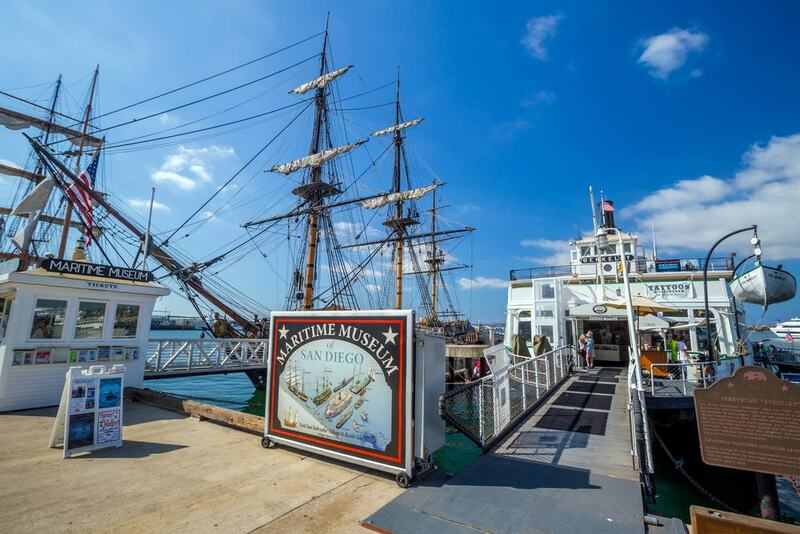 The Maritime Museum of San Diego has 11 heritage boats and submarines. The most noteworthy is the Star of India (1863), believed to be the oldest ship in the world that still sails regularly. Launched at the Isle of Man, this iron-hulled windjammer was built to carry cargo between Britain, India and New Zealand. Fans of military hardware will waste no time boarding the Soviet B-38 and US Navy Dolphin submarines. One ship you may have seen before is HM Surprise, a modern 18th-century British Navy frigate replica that appeared in Master and Commander: The Far Side of the World and Pirates of the Caribbean: On Stranger Tides. The museum puts on a military-themed 45-minute harbour tour in a Vietnam War-era Swift boat. One of San Diego’s oldest monuments, this lighthouse was raised in 1855 just five years after San Diego’s admission to the Union. 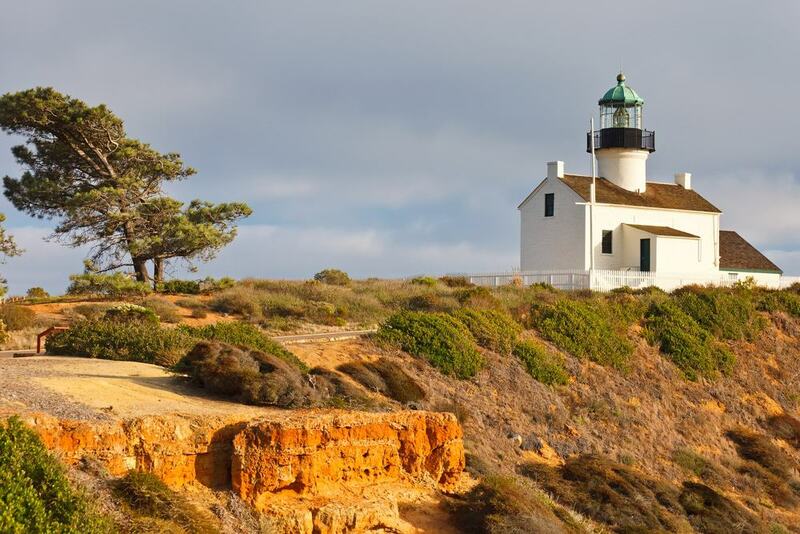 Its life as a beacon for ships navigating San Diego Bay was quite short and it was deactivated when the new lighthouse was built by the water, 120 metres down the cliffs in 1891. After the foundation of the Cabrillo Monument in the 1930s the complex was restored and is now a prominent landmark and museum. You can see the keeper’s living quarters, log books, service equipment, turning mechanism and the original Fresnel lens that once had a range of 24 miles. On certain days you may also be greeted by a re-enactor playing Captain Israel, a lighthouse keeper in the 19th century. Something we haven’t mentioned about Point Loma is the richness of the nature residing in the tide pools at the foot of the cliffs on the western tip of the peninsula. The rocky shoreline here is in the boundaries of the National Monument, which has kept it clear of development. Check the tide charts and keep them in mind, because when the ocean withdraws you can scramble down the terraces of stratified rock to poke around the sea caves and look for ocean life in the rock pools. You should spot sea anemones, starfish, lined shore crabs, hermit crabs, kelp crabs and maybe even an octopus. The humongous former Naval Training Center San Diego on Point Loma has been transformed into an exciting waterfront development. 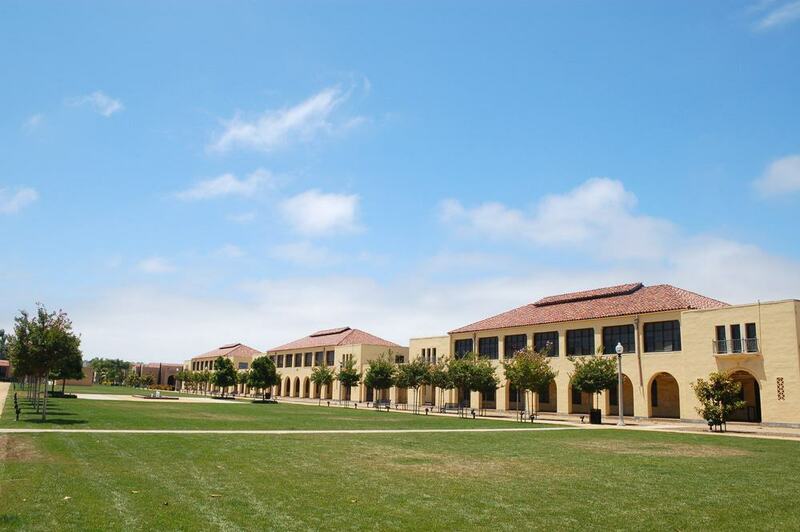 That naval base was founded in 1923 and is on the National Register of Historic Places, with rows of interesting former mess halls and barracks. The open space along the base’s old ship channel has become a waterfront park with play areas and jogging trails. Liberty Station is divided into an array of districts: Office, Hotel, Educational, Retail and Residential. For food, the Arts District, South Point and the Quarter are loaded with independent bars, eateries and cafes, well as nationwide chains like Five Guys, Tender Greens and Cold Stone Creamery. The NTC Promenade at Liberty Station is a non-profit arts area, home to the San Diego Comic Art Gallery and Women’s Museum of California, as well as theatre companies, four dance groups and the LOT at Liberty Station theatre. 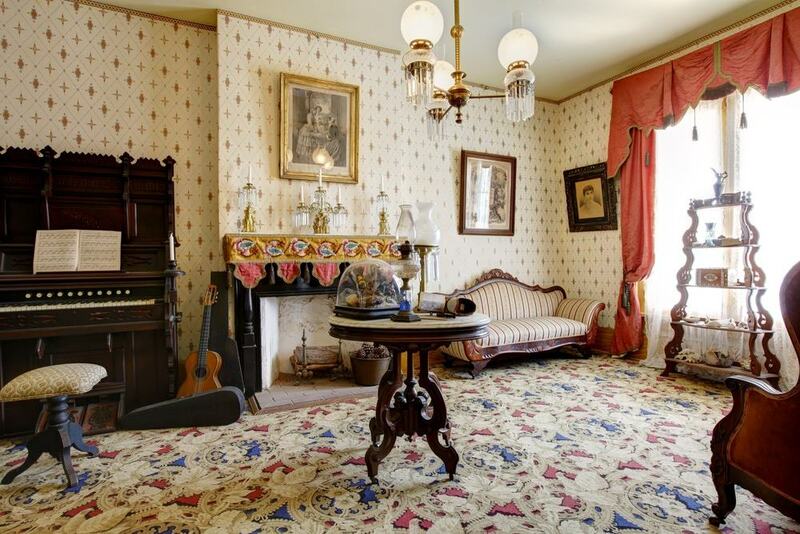 San Diego’s first two-storey brick-built building, the Old Town’s Whaley House dates to 1857. What kindles fascination about the building is its spooky goings-on. This National Historic Landmark was designated “haunted” by the U.S. Commerce Department in the 1960s. It appears that the house’s owner and designer, Thomas Whaley chose San Diego’s former gallows as the plot for his home. He claimed to hear one criminal, “Yankee” Jim Robinson (d.1852) stomping around on the top floor, and Whaley and his wife are believed to still be around, announcing themselves by the scent of cigar smoke and perfume. In the same ensemble is the French mansard-roofed Verna House (1870s), moved to this spot to save it from demolition in 1965 and housing the gift-shop. The interior, which also served as a courtroom for a period, has been frozen in time to the mid-1870s. The ocean in San Diego is always a thrilling sight, but the surf can be unsafe for children and less accomplished swimmers. In La Jolla one solution was to construct a big concrete seawall to the west, shielding this beach from the waves and creating a scallop-shaped cove with calm waters. The was gifted to the community by the philanthropist Ellen Browning Scripps in 1931, but what nobody anticipated was how attractive the beach would prove for seals and sea lions. December to May they come to wallow in the gentle waters and give birth to pups on the beach. Access to Children’s Pool Beach is discouraged in this season, but you can head along the seawall to get a good look at the winter residents with their babies. Call it a tourist trap, but this waterfront mall has a few things to recommend it. For one, there’s a series of restaurants like the Pier Cafe and Edgewater Grill, each with a front-row view of the bay. Seaport Village is on the south end the Embarcadero within walking distance of the downtown. You can make your way around a circular network of lanes lined with buildings in varying architectural styles from replicas of haciendas and adobes to Victorian houses. There are more than 50 shops for twee souvenirs like hand-painted tiles and mugs, and you can enjoy some live music on summer weekends. Look out for the carousel, dating to 1895, with beautifully rendered animals and mythical beasts to ride on. If this railway line has a romantic sounding name that’s because it clings to the Southern Californian coastline between San Diego and San Luis Obispo. The most scenic stretch is through the San Diego and Orange Counties when the train has a near constant view of the Pacific. These carriages are so accustomed to surfers that there are even special racks for surfboards. You could use the train for a day in Los Angeles, making sure to sit on the right side of the train on the return to San Diego to catch the sunset. There are multiple departures each day, and you can get to Disneyland in Anaheim in two hours and Los Angeles Union station in three. An abiding feature of the San Diego cityscape, the San-Diego-Coronado Bridge swoops across the San Diego Bay, carrying the State Route 75 to and from the island for a spellbinding perspective of the city. The design came from the Modernist architect Robert Mosher and the bridge opened in 1969, just two years after construction began. The reason for bridge’s signature 80° curve is that the Navy required a clearance of at least 61 metres for its aircraft carriers, and the structure needed extra space to reach this height on a safe gradient. If you need to see the bridge up close there are guided kayaking tours under the bridge from Coronado. 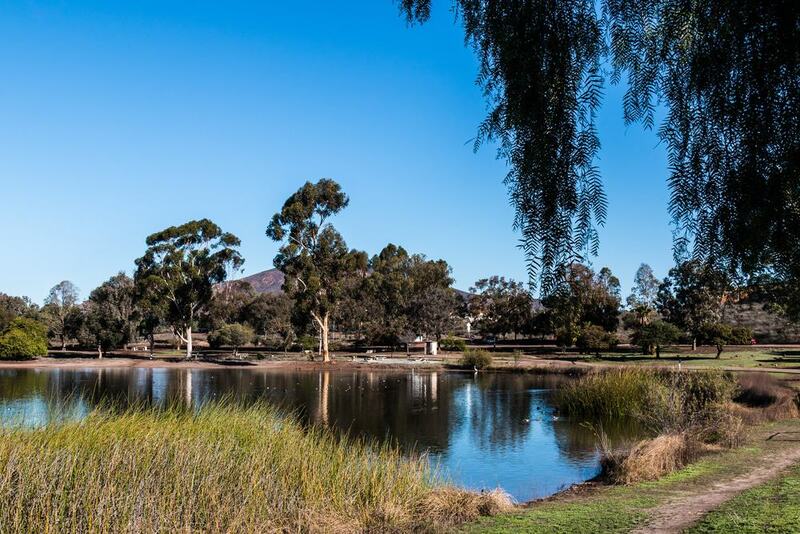 This whopping 5,800-acre natural preserve is inside San Diego’s city limits to the northeast, and is the sixth-largest municipal park in the United States. Snaking off into this rugged wilderness of scrubby hills and canyons are 60 miles of marked hiking, cycling and horse riding trails. One route will take you to the summit of Cowles Mountain, the highest point in San Diego at 486 metres and with a panorama of San Diego County that merits the climb. You can also track down a riveting piece of San Diego’s early history at the Old Mission Dam, a National Historic Landmark. The dam impounded the San Diego River to irrigate fields owned by the Mission San Diego de Alcalá. This modest construction represents the first colonial irrigation project on the United States’ Pacific coast. 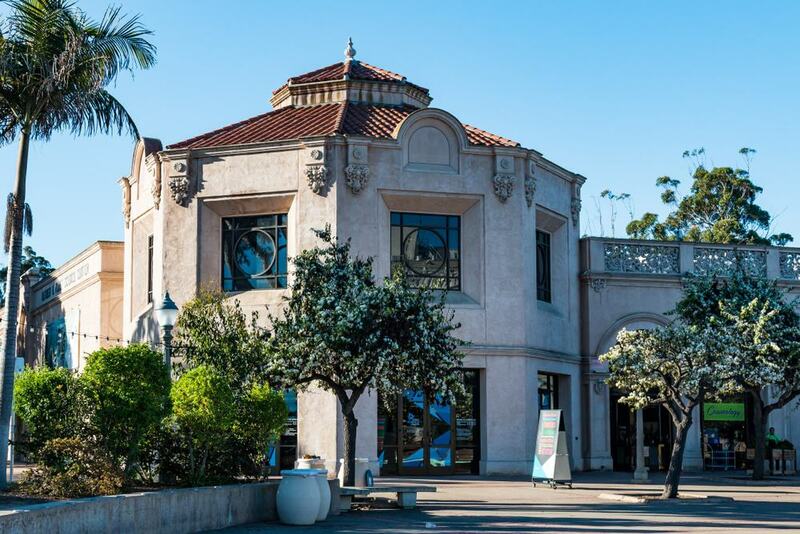 Established in Balboa Park during the California Pacific International Exposition of 1935-36, the Old Globe Theatre is a pillar of culture in San Diego. 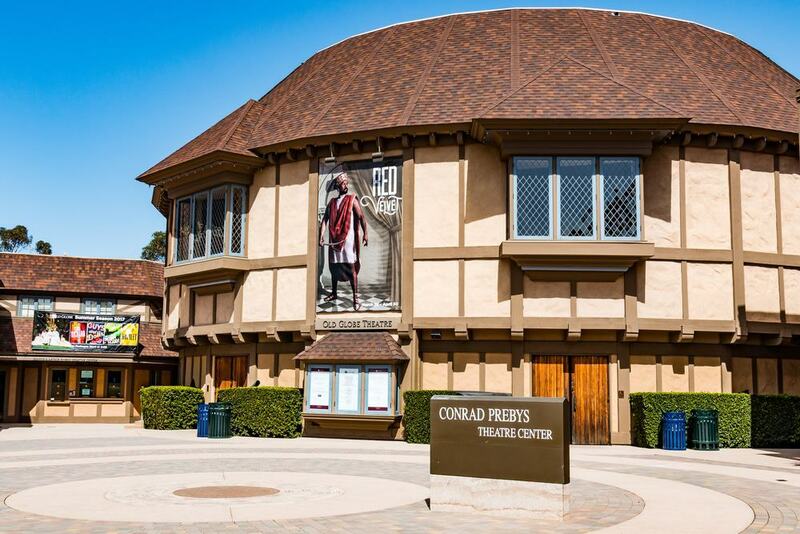 Among the top regional theatres in the country, this Tony-award winning institution puts on 15 productions of classic, modern classic and new works each season, with Shakespeare at its soul. The complex has three stages: The flagship Old Globe Theatre, the outdoor Lowell Davies Festival Theatre, both seating around 600, and the smaller Sheryl and Harvey White Theatre, a theatre in the round. For a snapshot of what to expect, there are two performances a day during the week and three on weekends. In July 2018 you could catch a family-friendly production of Dr.
Seuss’s The Lorax, or live the drama of Shakespeare’s The Tempest. 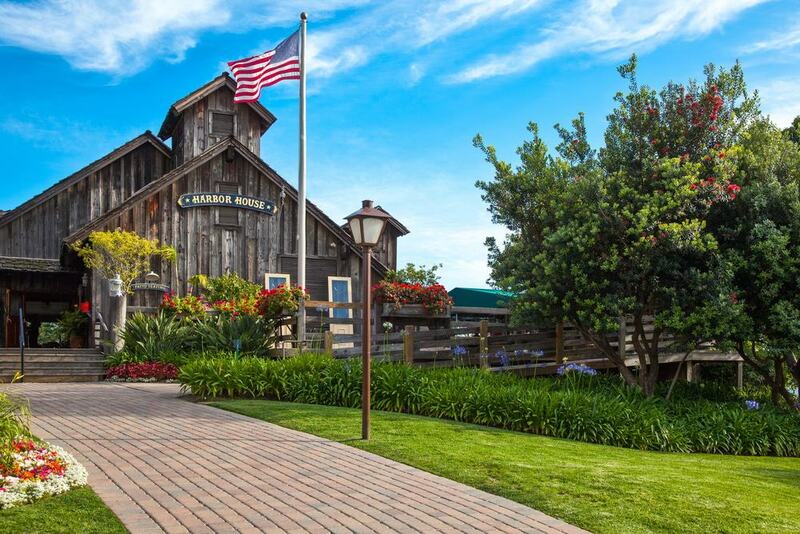 One of the former navy buildings at Liberty Station has been adapted for this enticing food destination. Open seven days a week, 11:00 – 19:00, the Liberty Public Market is like an urban central market, showing off the best of the region’s wine, beer, fruit, vegetables, meat, fish, pastries, prepared foods, sauces and arts and crafts. It’s a place for people who are concerned about food provenance to do their food shop, but is also a must for on-the-spot dining, with a dash of pop-up eateries and stands. Think lobster rolls, jambalaya, craft sausages, farm fresh salads, Thai-style streetfood and cold-pressed juice. The 36-hole municipal golf centre at Torrey Pines was established in 1957 and has real prestige. This totally public facility played host to the 2008 U.S. Open, which as of July 2018 was the last major title claimed by Tiger Woods. The U.S. Open is scheduled to come back to Torrey Pines in 2021. Plotted by the famed course architect William P. Bell and his son in 1957, Torrey Pines has two championship courses (North and South), and one of the largest golf shops in the Western United States. The South course was remodelled by Rees Jones in 2001 and has since staged a host of big events. 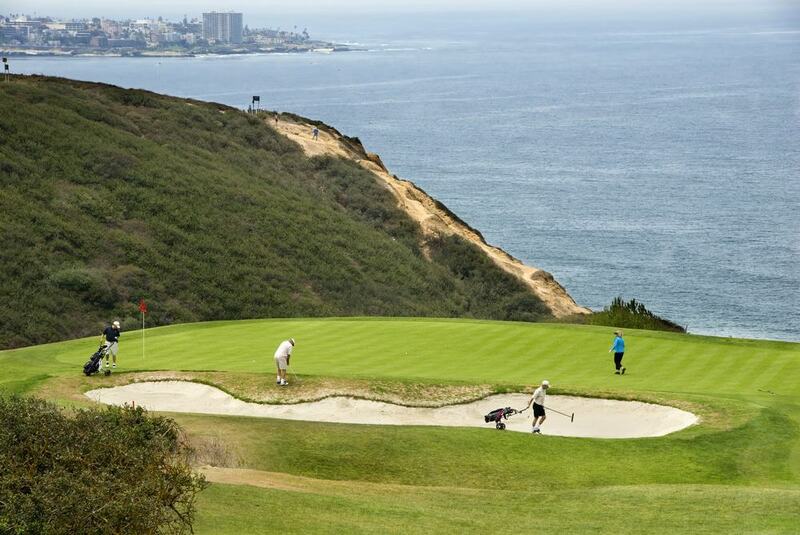 You can be sure that this course is in demand, and to book a tee time non-residents have to sign up with San Diego’s parks and recreation department and book online up to three days in advance. Saturdays from 08:00 to 14:00 more than 200 tents take over Little Italy’s Date Street, between Kettner Boulevard and Front Street. Local producers lay out regional meat, poultry, fruit, eggs herbs and vegetables, all seasonal and fresh from the farm, while there’s also fish, plants, spices, coffee beans, cheese, homemade sauces and relishes. Bring an appetite because you can indulge in oysters shucked on the spot, and sea urchin caught hours earlier. If that sounds too adventurous you might be tempted by paninis, crêpes, cheesecake in a cup, or go healthy with a green smoothie. Amazingly, this is just one of 20 weekend farmers’ markets in San Diego. What started as the Golden State Comic Book Convention, attended by 200 comic book fans in 1970, has burgeoned into the world’s largest annual pop culture festival attended by some 150,000 people. If you don’t already know all about Comic-Con you’re sure to have seen its legions of cosplayers online or on TV shows. 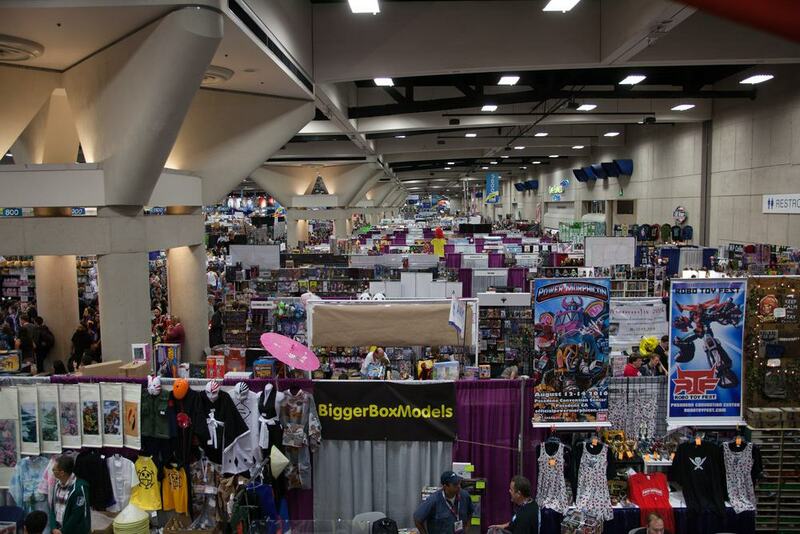 Held at the San Diego Convention Centre, Comic-Con (roughly speaking) is a four-day extravaganza of seminars, panel Q&As, table reads, workshops, gaming events, award ceremonies, as well as an independent shot film festival, collectibles market, studio/TV company trade exhibition and a cosplay contest. And where the scope was limited to comics in the festival’s early years, Comic-Con encompasses almost all forms of entertainment, even if there’s still a slight accent on comics and anime.